I was once told that the most searched-for property on a particular online materials database was transparency, and if the trend continues against petroleum-based plastic -- the other material family capable of transparency -- then maybe the future belongs to glass. But it's not just this slice of metadata that is significant, rather the massive rise in the use of this material family across all forms of design that is both connecting the world and disrupting our understanding of glass. Its transparency has allowed it to become the backbone of the digital age silently and quietly, yet it is in the foreground of many aspects of our daily routines, mostly without us noticing its abundance and importance. At the same time giant shards are used to spectacular visual effect as a building material. From the planet's interactive touchsensitive screens, phones, tablets, phablets, games, laptops, in-flight entertainment screens, information points in city hubs, and TVs to fibre optics that transmit and connect data and these devices, through to the more heroic, press-worthy case studies, such as glass that is self-cleaning or the optical building facades of James Carpenter. Glass is the material with which technology and the built world is powering ahead. One of the reasons it is increasingly used in such abundance is that science has reached a point where it can change the physical characteristics of glass altogether to make it more suitable to our specific needs. By tweaking its molecular make up and combining it with other materials we can enhance its properties and 'mend' some of its inherent flaws, the very flaws that define it as a brittle material. 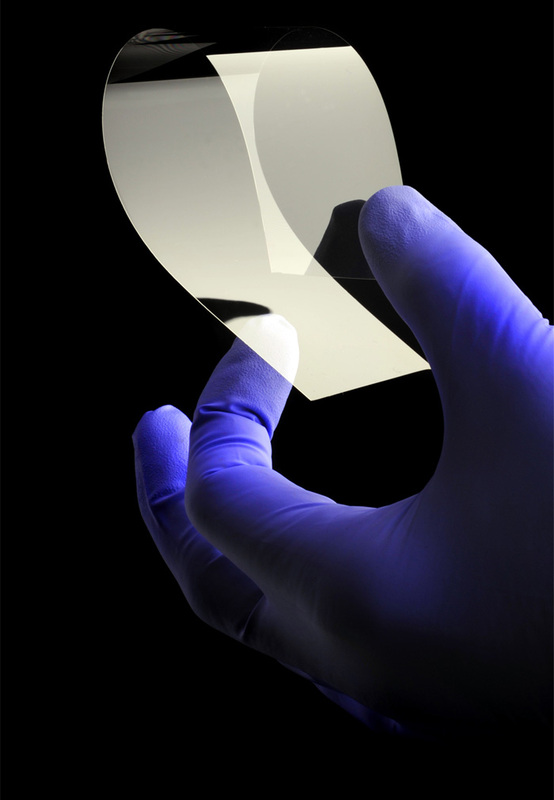 Not only are new grades being developed, but entirely new breeds of glass are being conceived. Take for instance USA-based Corning, which is achieving some remarkable performance-enhancing feats with many new glass formulations. One example is Willow Glass, a treated sheet glass that combines ultra-thin (0.1mm) capabilities and lightness in weight with the durability and hardness of conventional soda-lime glass. This has given resurgence to a material born in antiquity and allowing it to forge an alliance with new technologies. Applicable to consumer electronics, interior panelling and appliances, Willow Glass can provide scratch-resistant surface for electronics and when laminated to less durable substrates (it's so thin it is sold on a roll) it gives an extremely durable coating. As with Gorilla Glass, Corning's better known thin and tough glass, it is being applied to interiors, architecture (panelling on lifts), automotives and billions of mobile phones. It is facilitating the creation of environments that are not only changing our notions of glass but also redefining what is a passive and what is an interactive surface. In the future we will see these lightweight and strong breeds of glass being used more in applications that exploit smart surfaces and interactive touch in walls and panelling, potentially leading to a hybrid of interactive home appliances and interior spaces. Through these new glasses buildings and products will become smarter, linking the digital and physical in new ways. It is through these technologies that glass is being redefined. No longer is it just the rigid and brittle material that we are familiar with -- it is taking on properties of other material families. Fibrance Light Diffusing Fibre for example is an optical fibre that came out of research in fibre optics that instead of trying to retain light, looked at what happened when that light is allowed to escape the walls of the fibres. The result is a 0.5mm diameter glass that transmits light from a single source at one end of the fibre, evenly across its whole length. This wire of light is so thin it can be wrapped around your finger without breaking, and allows for light to be carried into wet, temperature-sensitive areas and other difficult-to-access areas using traditional and even other non-traditional forms of light.